Why does Ballarat have two spellings? Ballaarat is the older spelling which was commonly used in the 1800's. It may have been derived from two words of the Wathawarrung people: balla and arat, meaning resting place. This spelling was later simplified to Ballarat, though both versions co-existed until 1994 when Ballarat was officially adopted as the correct spelling. 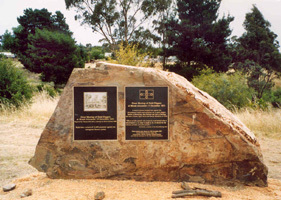 The Ballarat Reform League Inc.
Our first project, The Monument Project, was launched in 2003 to place plaques and monuments on sites across the Victorian goldfields where significant actions occurred that culminated in the formation of the Ballarat Reform League at a public meeting on 11 November 1854. These actions grew to a climax on 3 December 1854 in the battle at the stockade on the Eureka lead in Ballarat. The project was made possible by the generous support of The Vera Moore Foundation and with advice from Professor Weston Bate. Our second project was begun in 2014 to establish a wiki website to eventually include all Eureka related documents, images and information, including biographies of people involved. Eurekapedia offers reliable, referenced and moderated information for free for an online audience. 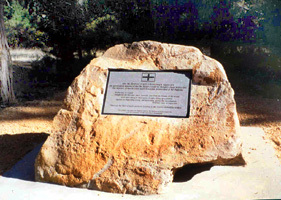 Eureka is significant in Australia’s political and social history. Eurekapedia records this history. 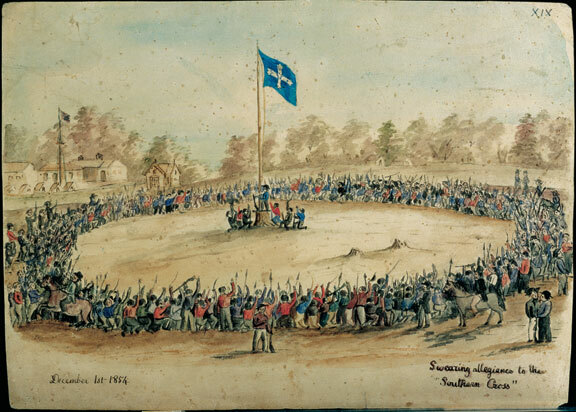 Charles A. Doudiet 'Swearing allegiance to the Southern Cross', 1854, Watercolour. Purchased with the assistance of many donors, 1996. The original Ballaarat Reform League was active for only a brief time around October and November 1854. A committee that was known to meet at The Star Hotel in Main Road, Ballarat, had reportedly been initially formed to organise the defence of prisoners taken for the burning of Bentley's Hotel (17th October 1854). The committee went on to discuss and formulate a Charter outlining such goals as manhood suffrage and full and fair representation. The Ballaarat Reform League was a movement that grew out of the frustration that the diggers felt with their treatment on the goldfields. The new Victorian government had within a month of the official discovery of gold in Victoria in August 1851, imposed a large licence fee for the right to dig for gold. The fee was unpopular but the even greater irritant was the heavy handed, and at times corrupt, administration of the goldfields by the local officials. Eventually collecting licence fees became armed hunts. The protests against the injustice of their treatment began in Buninyong in August 1851 and as the search for gold spread across Victoria so also did the protests and the calls to the government to listen and to remedy the situation. The Ballaarat Reform League was the final movement seeking to broker a peaceful deal. Its calls to the government were ignored. The brief battle at the Eureka stockade which followed was an unnecessary battle for which the government stood condemned. The peaceful goals of the Ballaarat Reform League were achieved but at the terrible cost of many lives. - the envy of its Chartist antecedents in Britain ... its basic demands won in 1855."